Published weekday mornings, the Minnesota Rising blog shares inspiration, news, events, and original content about innovative and collaborative leadership, current and future Minnesota matters, and the rising Millennial generation. On a monthly basis, the Minnesota Rising Dispatch curates noteworthy events and opportunities for emerging leaders across the state. Subscribe to the Dispatch here! MNRising 2014 UnConference-HD from Diane Tran on Vimeo. Hosted by and for emerging leaders, the Minnesota Rising Un/Conference engages emerging leaders across Minnesota in an energizing day of innovative learning and dialogue, skill-building, and network-building with their peers! The annual daylong event features an inspiring keynote speaker, breakout sessions led by young Minnesotans, and an Open Space Technology workshop to shape the day to reflect and connect to the most urgent and relevant conversations for attendees. Explore past Un/Conference themes, content, and schedules below. Minnesota Rising 2010 Un/Conference: Making Our Mark on Minnesota! Tony LookingElk advised us: "To speak with one voice you need to find the words that represent everyone." How? We believe that the answer is to keep asking ourselves the question. 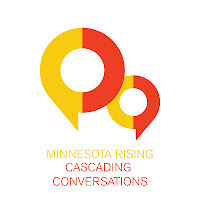 Since October 2011, “Our Minnesota” has connected emerging leaders through a cascading conversations tour, which aims to collect the ideas of thousands of Minnesotans from across the state through one-on-one conversations. These conversations have sparked fun, engaging opportunities for people to discuss their values and visions for Minnesota’s future and to begin taking steps toward making that future a reality. Collaboratively designed by young Minnesotans using principles of Appreciative Inquiry, this generation-wide conversation tool leverages our collective imagination for responding to our common call. Want to join the cascade? Sign up here to be invited to a conversation and help build a state of trust! Minnesota is experiencing vast change due to rapid advances in technology, increased political polarization, and diversifying demographics. In June 2013, Minnesota Rising hosted a thought-provoking, "Collaborative Competence: Cultivating Capacity for Collective Leadership" World Cafe to explore how these trends can provide us insight into the new kinds of leadership that will be required to navigate and shape a future we can all be proud of 30 years from today. Building on learning from the Millennial Leadership: "Different by Design" World Cafe in June 2012, this facilitated conversation helped to identify key collective leadership competencies that can be cultivated in order to lead collaboratively into the future. The Minnesota Rising Learning Labs Series and corresponding collaborative competence resource collection aim to provide emerging leaders a supportive community and innovative methods to study and practice these critical skills. An initiative of Minnesota Rising organized for and by people of color, LOCUS seeks to serve as a meeting ground for people from diverse backgrounds to engage with one another and to clarify our collective needs and our common aspirations. Through the pursuit of stronger connection and inclusiveness, and by striving for equitable and representative leadership, we aim to create a community that embraces and supports each and every person. The LOCUS blog features relevant and timely news, job postings and board openings, and other local events and opportunities for communities of color in the Twin Cities region. LOCUS regularly hosts dialogues and events for and by people of color in order to cultivate a pool of people ready to serve and lead in our local communities.